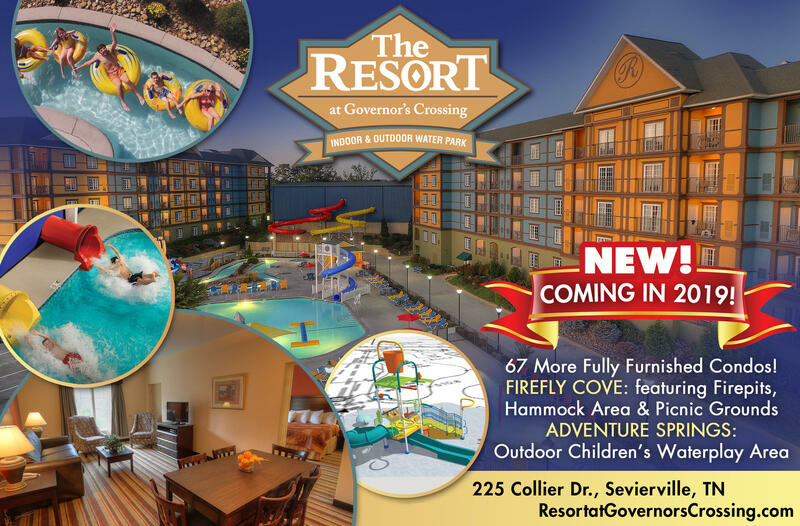 Sevierville, TN – The new 67 Unit expansion at The Resort at Governor’s Crossing is being celebrated with a topping out of the brand new $12 Million dollar condominium building; featuring room layouts for families of varying sizes and with special emphasis on multi-generational units. The new building is designed to bring families together for the ultimate Smoky Mountain Vacation. Don Collier, President of the HOA says “When the rental management company proposed this addition we challenged them to develop unit types that would compliment what we already have instead of replicating what exists in the other two buildings. They conducted in depth research with the guests and are now well positioned to enhance the overall experience at The Resort and offer amenities that families have wanted, but couldn’t get before.” The new 1 Bedroom Unit, for example, features a private master bedroom with a king size bed and a sleeping galley with two bunk beds. The largest unit is a 3 Bedroom Unit and will accommodate up to 18 guests. Detailed unit layouts will be published later this year and can be reserved now for family vacations. This $12 Million investment is important not only for the Sevierville economy, but the entire Southeast. “When we began the design process I knew for this project we needed to support the communities that have made us successful. We looked at our major markets and what they manufactured in those areas. Our tile is coming from Crossville, TN and carpet from Georgia. Our furniture is all out of Virginia and textiles from Florida. The Resort at Governor’s Crossing is not only made in America, it is made here in the Southeast,” shared Kay Collier-Pittman, President of Governor’s Crossing Leasing and Management who operates The Resort. The new units have been upgraded to include granite counters in the kitchen and bath, 50 inch televisions in the living rooms, all wood furniture, and designer carpet. All units are fully equipped with the conveniences of home a full kitchen, washer and dryer, and a full living room for family gathering. With an ideal location in the Smokies, The Resort is just minutes away from everything. “Guests really love the easy access to Dollywood from Collier Drive. Many guests are surprised at just how close we are to Dollywood and all of the other wonderful attractions in the area. 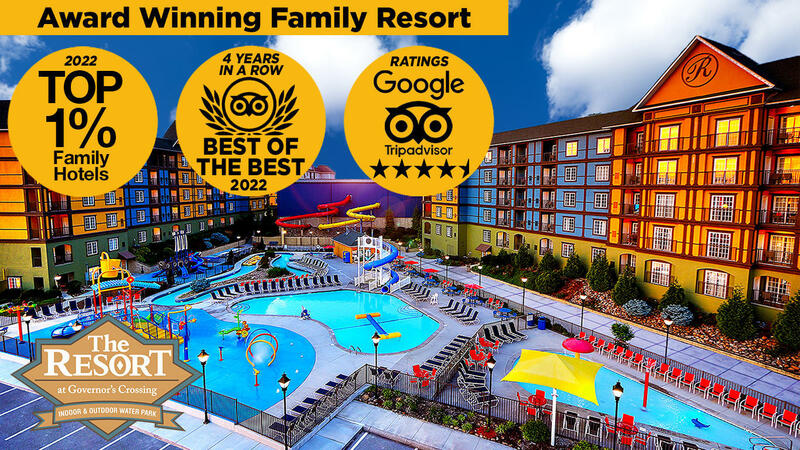 When you combine that with all of our amenities and luxury accommodations it is easy to understand why over 60% of our guests have stayed with us before,” stated Tabitha Lippi, Director of Operations. The Resort features a wide variety of amenities like Indoor and Outdoor Waterparks, Putt-Putt, and the Pirate Playground. “With the addition we wanted to create a new guest space to round out their family getaway. We created “Firefly Cove” a new family area with lots to do!” said Kay Collier-Pittman. The new area will feature fire pits with comfortable seating, a picnic grounds equipped with grills, a new kid’s playground, and a hammock relaxation zone. That is not, the only new area coming to the Resort! They are also expanding the Outdoor Waterpark with the brand new “Adventure Springs.” According to Don Collier, “This new area is a joint venture between the HOA and the developer. It is a large play structure using over 1,500 gallons of water a minute.” It will feature two slides, a dual racer slide and a fully enclosed slide surrounded by more than 30 interactive elements encouraging interactive play with kids. What really makes it exciting is a 300 Gallon Dump Bucket that drenches the entire play area every few minutes. Adventure Springs will open in the Spring of 2019. Governor’s Crossing Leasing and Management & The Resort Board of Directors invite you to join them Thursday, October 18th at 10:30 AM for the Topping Out Ceremony at 225 Collier Drive, Sevierville TN, lunch will follow.